I really like the concept, especially the fact that Calla human & wolf both share the same eye. I’m not sure if I prefer it to the original cover, but it sure is beautiful! I really like it to, I can’t wait to have my own copy! It would seem that the first cover they released for the second book won’t be available at all, but Andrea isn’t sure. I like the new covers, but hope they are both the paperback versions. 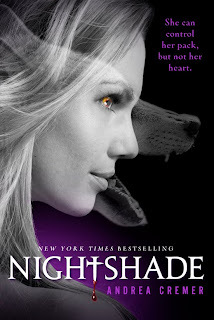 I LOVED the cover of Nightshade and thought the previous cover for Wolfsbane went so well with it! Wow, I love how Calla and the wolf share the same eye too, that is so creative! The new covers are so dark and lovely but I really liked the bright colors of the original covers. I hope they change their mind and have separate covers for the hardback and paperback versions. I really loved both versions. I'm extremely mad about this. What they could've done was have these new covers as paperbacks and have the lovely colorful ones for hardcover, but no they had screw everything up. I don't like the new covers and I would'nt even wanna be seen wit that cover. Being a graphic designer is messing wit my head. I see thigns too differently now. I'm diggin the new covers myself. Both covers are great. Oh this looks great! I really like the new cover. I haven't read it yet, but it is on my want list. :) Thanks! I prefer the old covers...but I like the new version of nightshade, looks cool. 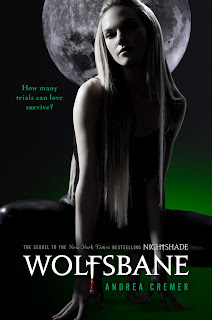 The Wolfsbane cover I'm not a fan of. It would be good if they had kept the original covers for the hard backs and these new ones for the paper backs. Seeing these new covers has kind of thrown me off this series...but that's just my opinion. I personally really liked the original covers more. However, these covers are pretty as well! Thank you for letting us know Tynga!